I was getting ready to go make a pair of socks on my sock machine. I went to a Facebook website for sock knitters to refresh my memory and I saw this project. The woman said she just knitted five sock heels and then closed it and made a pin cushion. So , I thought I would let beginners know how to short row on the knitting machine before attempting a pair of socks. This can be done on other machines by just putting needles into hold. On the passap, we work with the pushers to make them knit or hold a stitch and using the LX lock setting. On my sock machine I have a 72 needle cylinder. The toe and heel are worked on 36 needles. So, I decided to work with the same amount on the passap. I like the size the pin cushion is but if you want to use less needles to make it smaller, by all means, experiment. If you want more definite ridges, short row down more than what I did here. I short rowed to 14 stitches and then back out again. The great thing about learning from this lesson is that you are only working on the front bed and you can open the beds to hang weights and see everything clearly. I have passap heel weights that are flat and slide in nicely between the beds.They are well worth the investment. Are you ready to try it? And to get a pin cushion out of your lesson? I used sock yarn at a tension 5 and black pushers. While you are short rowing pay attention to your stitches. If they look like they are starting to rise up, open the beds and move your weights up. With this many needles you won’t have a big problem but move them up for sure after you short row decrease and after you short row increase in this exercise. After the first heel is complete, you can take off your cast on comb. Cast on double bed one row and hang a comb so that it will catch the stitches when you remove the back bed needles to out of work position. If you hang it wrong the comb will fall to the floor. Now knit about 10 rows of waste yarn and then knit one row of ravel cord. I am going to be seeing some friends of mine and decided to make these little treat bags. They are just the right size . They each hold ten pieces of candy and one sucker. Since I started the bags at the top edge, the design is knit upside down. There is a green stem on top of each pumpkin but hard to see. When I knitted, the first two rows were black and green and then the rest are black and orange . The pumpkins looked distorted but that is because candy is in the bag. I made these on the passap but you can do them on any machine. Here are the instructions in my drop box. My sister is putting a lot of snowmen on her Christmas tree this year. I saw this snowman on Pinterest with just the glass ball and white snow inside and the painted face. Well, I did not have snow so I used salt. Stop laughing!! Then I decided to try knitting a little black top hat. I think it came out cute. I used 2/24 yarn and I made the brim on the Brother 940 electronic and I hung that on the Passap machine and knitted circular to finish the top part. It took no time at all. I used a 1&1/2 inch glass ball. I painted the eyes, mouth and nose . If you don’t want to knit circular I have directions for knitting straight on the single bed.Here is how I did it . This is a good lesson for short rowing for beginners. Okay, I know you were expecting a lot more in knitting from me. The truth is that I want to get knitting more but we are working on our house. I just finished staining all the woodwork for 9 doors and baseboards. So I was able to play around in between the staining and varnishing. 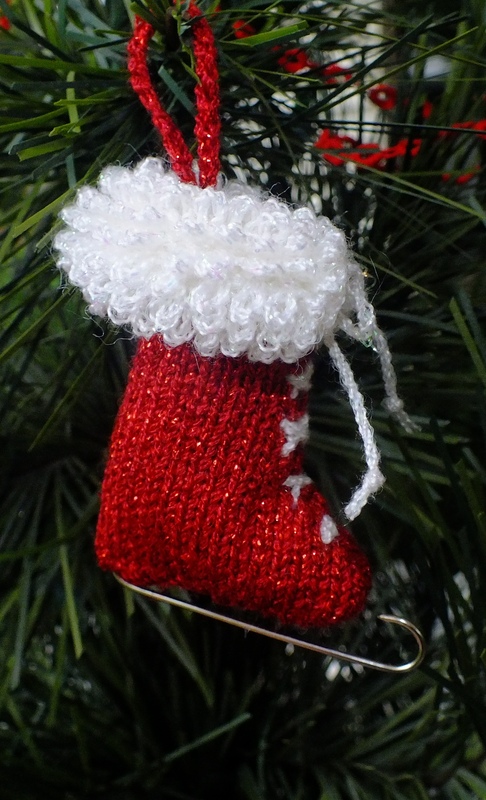 I know I need to get a life when I look at the hours I spent to get this little ornament knitted. I think it is cute though so time was not wasted. I got the idea from a magazine picture of a felted ice skate. This can be knitted on any machine but you would have to do a different cuff. The cuff is the carpet stitch and I used the stitch ditcher attachment but you don’t need one to do this. It is just faster and easier with one. The great thing about this carpet stitch cuff is that it curls around the top of the skate body by itself. I tried making this four times and the best way to knit it is to knit the cuff, take off on waste yarn and then knit the shoe part from the bottom up so you are doing decreases instead of increases. I then Kitchener stitched the cuff to the body, hung the sides on machine with right sides together and bound off and then when I came to the bottom where the waste yarn was I bound off two stitches at a time. Turn in side out and stuff lightly. I made laces with the white yarn. Pompoms would look cute on the ends of the laces. Or you could put a pompom on the toe like I used to do eons ago when I used to roller skate. The yarn I used was called flash I believe. It has a very pretty sparkle to it. The cuff has sparkle in it but it is hard to see in my picture. If you want to make it here are my pattern instructions in my drop box.